Red yeast rice is a food product created by fermenting rice with a strain of red yeast. Policosanol is a natural mixture of higher aliphatic primary alcohols derived from sugar cane or bees wax. We use sugar cane because it’s better. Policosanol does not inhibit the HMG-CoA enzyme. 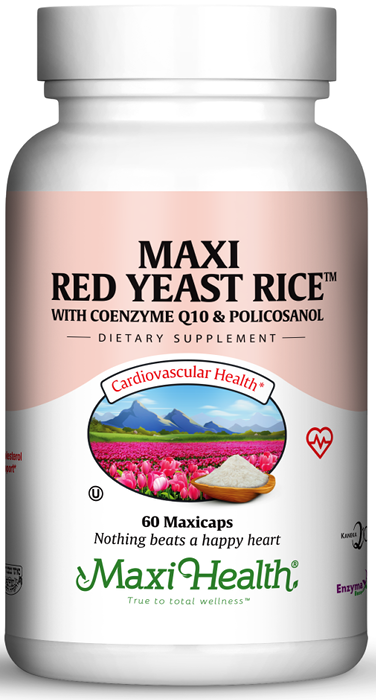 Try Maxi Red Yeast Rice™. Take one (1) capsule twice daily with meals, or as directed by a health care professional. For best results take with CH Control™. This product contains no added sugar, and no animal products, wheat, soy, gluten, salt, milk, artificial flavorings, colorings or preservatives. Enzymax®, a vital digestive enzyme complex, is a registered trademark of Maxi Health Research® LLC. • Kaneka Q10™ is a trademark of Kaneka Corp.